Since 1991, I've been editing articles written for biomedical journals. I've done it as an employee of journal publishers, as a freelance editor with journals as my clients, and as a freelance editor with authors as my clients. And since 1991, I've wished that there was a reference work that taught authors about the process of getting their writing published in journals, so that instead of my having to teach them in bits and pieces, they could find all of the information in one place. Thank goodness, Philippa J. Benson, PhD, and Susan C. Silver, PhD, have created exactly that: What Editors Want: An Author's Guide to Scientific Journal Publishing, just out from the University of Chicago Press. It's well organized, it's comprehensive, and it's authoritative. I fervently hope that medical schools and university science programs everywhere will make it part of their curriculum. Medical and science students are taught how to do research, and often how to report it, but they generally aren't taught about the publication process and how to navigate it. That makes the process unnecessarily frustrating both for researchers and for the editors-in-chief of journals—and hey, journal staff members and freelance manuscript editors too. The University of Chicago Press sent me a free review copy of What Editors Want, at coauthor Benson's request. I have a connection to Benson via Facebook. On Facebook and on Twitter, where I post a lot of publishing-related and science-related information, I have become friendly with Jennifer Kuhn, who provided administrative assistance to Benson during the process of writing the book and is now assistant managing editor for the American Society for Parenteral and Enteral Nutrition. Kuhn connected me with Benson. I adore the Chicago Manual of Style, published by the same press as What Editors Want, and I am guided by it for some of the book-length manuscripts that I edit. I am a member of the Council of Science Editors, one of the organizations through which the authors met. I have been invited, by one of my longtime author-clients, to travel to China at some point and teach the young researchers in his hospital department about writing for publication. I plan to use What Authors Want to guide me in teaching those researchers. As mentioned earlier, you should never allow your emotions to influence your response to a rejection letter. Usually, a little time and the immediate ingestion of chocolate or alcohol will sooth[e] the pain and you will start to see what you can do to get the manuscript back on track. Do nothing for at least twenty-four hours or until any strong emotions have subsided. Part of what makes this book so valuable for researchers who are navigating the U.S. publishing world for the first time is that Benson and Silver have been on both sides of the author–publisher relationship. Silver said, of the process of writing the book, "On a couple of occasions, we completely failed to take our own advice about the book. ... It took us a while to ... see that there were some useful points [made by one of the manuscript's reviewers]." There's an aspect of the book that editorial professionals like me might find surprising, though it is minor compared with the importance of the book's content: Throughout the book, the word editor is capitalized. I wondered about that style choice, so I asked the authors about it. Silver explained that the University of Chicago Press "argued with us a lot about that because it's against their style. Our point was that in this book, [editors have] a starring role. It's their wants and needs that are being discussed. They were an important character in the book." Benson added, "We wanted to build the persona of the editor, and one of the ways to do that was through capitalizing [the word editor]. We had to pick our battles carefully with Chicago. We really were very mindful about the things we pressed hard for, and this was one of them." Who cares what Editors want? Preparing for manuscript submission, or "What Editors wish you knew"
The authors' coverage of those issues is thorough, and I did not find myself wishing that they had dealt with additional topics. All of their advice is on target, especially for would-be authors to look at issues of their target journals before definitely deciding to submit manuscripts to those journals, to read and follow in detail the author instructions of their target journals, to educate themselves about the permissions process, and to learn how the peer-review system works. I found only one problem with the book: The cross-references in chapters 4 ("Authorship Issues") and 5 ("Choosing the Right Journal") to sidebars 8.1, 8.2, and 8.3 from chapter 8 ("Preparing for Manuscript Submission, or 'What Editors Wish You Knew' ") are incorrect. For example, in chapter 4 the authors refer readers to the sidebar on choosing a language-polishing service, and they note that this is sidebar 8.3, but it is actually sidebar 8.1. Benson heads the firm PJB Consulting, where she is currently working with organizations such as PLoS One and the American Society for Nutrition on author education and publishing-services projects. She is also on the faculty of the Master of Professional Studies in Publishing program at George Washington University. Silver is editor-in-chief of Frontiers in Ecology and the Environment, published by the Ecological Society of America. She has held editorial positions at Academic Press and the British Dental Association and was editor of Biologist and The Lancet Oncology. Benson and Silver told me that they got to know each other through annual meetings of such U.S. organizations as the Council of Science Editors and the Society for Scholarly Publishing. The book grew out of workshops that they later led together in China to teach, as Silver said, "young researchers how to navigate the Western journal landscape." Silver said that some colleagues wondered why she and Benson were "going all the way to China" to teach this material, saying, "We need this stuff here." Benson said that the content of the workshop evolved each time they taught it, and it occurred to her that it would be very helpful to have a textbook to use in teaching. Benson suggested to Silver that the two of them should write that textbook, and Silver, the more cautious of the pair, eventually agreed. Carol Anne Meyer of CrossRef: "What authors need to know about CrossRef DOIs [digital object identifiers], CrossCheck, and CrossMark"
Monica Bradford, executive editor of Science: "Honesty in authorship"
Kepin Ma, professor at the Institute of Botany at the Chinese Academy of the Sciences: "The challenges of publishing as an international author"
Catriona MacCallum, senior editor of PLoS Biology and consulting editor of PLoS ONE: "Choosing open access for your paper"
Carol Edwards, publishing manager of TESOL International Association: "The permissions process"
Lyndon Holmes, president of Aries Systems: "Online manuscript submission and peer review systems"
Diane Sullenberger, executive editor of Proceedings of the National Academy of Sciences of the United States of America: "Ethics in scientific publishing"
Robert M. Harington, publisher for the American Institute of Physics: "The future of publishing"
The authors told me that they welcome feedback on the book because they would like to make any necessary corrections or additions to its next edition. You can write to them at whateditorswant@gmail.com. Silver added, "And if there are any additions [for the book], we can still include it in our teaching." 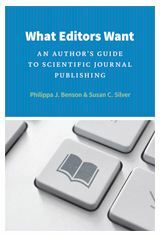 What Editors Want: An Author's Guide to Scientific Journal Publishing, by Philippa J. Benson and Susan C. Silver, from the University of Chicago Press. Available in several formats: cloth (ISBN 978-0-226-04313-5; US$55), paperback (978-0-226-04314-2; US$20), and e-book (978-0-226-04315-9; US$7 to US$20); 192 pages. I'm posting the following on behalf of a colleague who had trouble with Blogger's comment interface and thus e-mailed her comment to me. I am so impressed with your book review! Thanks so much for writing such a thorough review on what seems like a great book. I've been teaching PhD candidates at my local university's Graduate Center for Life and Natural Sciences for four years now and am always looking out for new instructional material. There's a real lack of solid, concise information available, but What Editors Want sounds like it could even make my required reading list! That said, I would love to hear about any books/materials you decide to use for your China workshop. I've really struggled to find things appropriate for my setting and end up cobbling things together a bit differently each semester as I find new things and/or notice different trends among my students' needs. The bulk of my material is my own creation with very little support coming from published sources. While this is probably nice for my students, it can be very time consuming on my end. A German textbook publisher actually contacted me about helping write a short textbook series on academic writing, but the project is continually bumped as books for higher ed are not a significant source of income. Frustrating! Tim Skern's Writing Scientific English is, in my opinion, too horribly written to ask students to purchase/read, but the short exercises he includes have been useful templates for showing me how to create my own exercises. His background is also with helping native German-speakers. Stephen Bailey's Academic Writing: A Handbook for International Students also has some good exercises to get things going, although he has no scientific focus. The business student version of his book [Academic Writing for International Students of Business] is great for the undergrad writing course I teach to business and econ students, where I have much more time to really suss things out. His short chapter on when to use articles (a, an, the, etc.) breaks things down nicely and might be worth looking over for your Chinese workshop participants. The best book I've found so far is Successful Scientific Writing: A Step-by-Step Guide for the Biological and Medical Sciences by Janice and Robert Matthews [and John Bowen]. This book is OK content-wise and can be difficult reading for ESL students. If you're able to find a book like Langenscheidt's Scientific English für Mediziner und Naturwissenschaftler in Chinese, you may have the makings of a great resource book. I strongly recommend that my students purchase this book. It could be seen as a crutch, but because it offers lists of words and phrases commonly used in each section of a research article it can really help improve their style. I'm sure there must be something like this in Chinese. I hope you'll be pleasantly surprised by how rewarding it is to teach writing skills in person. It certainly has been one of the best surprises I've enjoyed in the past few years! I just love seeing the expressions on my students' faces when they realize how they've improved and am excited that you'll also have this opportunity!